The Minnesota State Fair is just around the corner, and each year around this time Minnesotans get excited to hear about the new foods that will grace the extravaganza. While some foods sound delicious, the fair always brings odd food concoctions like "Bacon Ice Cream" and "Burger Dogs" which in turn has people dying to try these fair-only foods. This year is no different, and the new foods this year are nothing short of interesting. This year will bring 40 new foods, including 11 new frozen treats. The fair is without a doubt one of my favorite events of the Minnesota year, and I am always making a list of the new foods I want to try. Now only days away, I can already taste the new foods, and some of my old favorites. Let's take a look at some of the highlights. The Burger Dog sounds great, a weiner of ground beef, hot dog, cheese, bacon and just a touch of jalepeño, all tucked nicely into a hot dog bun. You can find this at the Gass Station Grill by the Food Building. Cowboy Bites are bite-sized mashups of bacon, sweet corn kernels, cream cheese and jalepeños, breaded and then fried. Of course it's fried. It's the fair. You can find this at the Frontier Bar. Deep Fried Ribs (again, everything is fried) is the one that interests me the most. The Ball Park Cafe is serving these up. 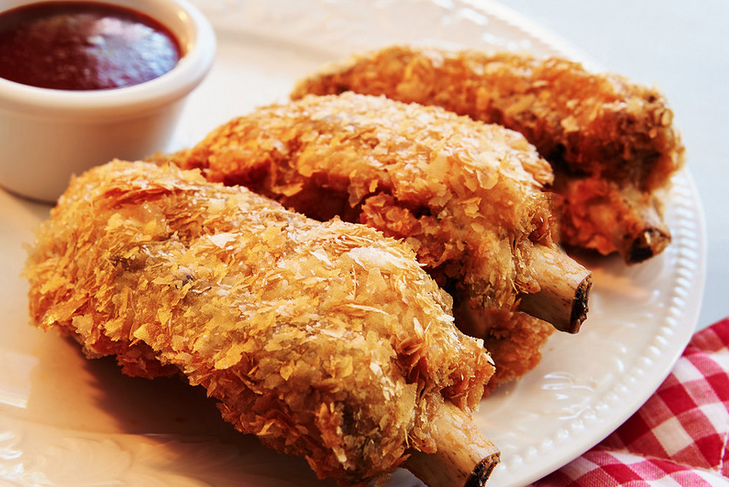 The smoked baby back ribs are battered and fried and served with, of course, barbeque sauce. How about a Mac and Cheese Cupcake? I don't think I need to explain what this is. You can find this at LuLu's Public House.